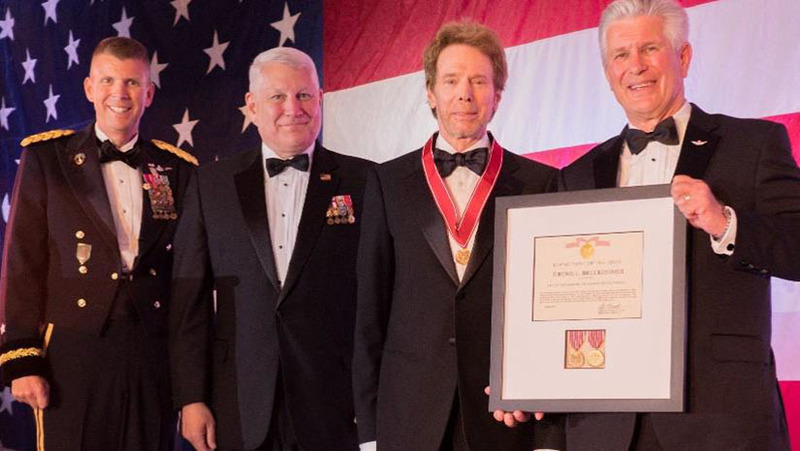 Renowned motion picture and television producer Jerry Bruckheimer was presented the Army’s Outstanding Civilian Service Award at the Association of the U.S. Army’s Greater Los Angeles Chapter’s Army Ball celebrating the service’s 242 birthday at the Long Beach Westin Hotel. Honoring Bruckheimer are, from the left, Brig. Gen. Jeffrey Broadwater, retired Gen. Carter F. Ham, Bruckheimer, and Pete Seitz, chapter president. This award, one of the highest awards given to a civilian by the Department of the Army, was presented at the AUSA ball by Brig. Gen. Jeffrey Broadwater, commander of the National Training Center, Fort Irwin. Calif., who represented the Army chief of staff. The recognition also honored his support of all military personnel and first responders through his productions such as: “Top Gun,” “Crimson Tide,” and the “CSI” television series, to name a few. Also present for the presentation were retired Lt. Col. Pete Seitz, Greater Los Angeles Chapter president, and retired Gen. Carter F. Ham, AUSA president and CEO.